Our list of top rated baby play yard brands is based on reviews that have been posted online and opinions shared by moms in my local circle of friends. It comes as no surprise that most of the best baby playards are manufactured by trusted brands known for putting safety and convenience of use first. Everyone will recognize the name brand of the winner that took first place, Graco. 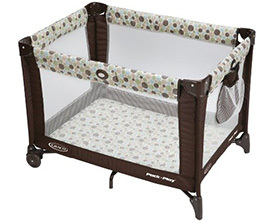 Graco's very affordable play yard has not just one model on the list but several. The reason being that some are considered travel styles, and some models have a variety of accessories such as bassinets, features including automatic, folding feet and rocking seats. Graco offers a wide variety of styles and price points and most parents could find at least one to fit their lifestyle but there are some newcomers that are worthy of mention on our list of top rated baby play yards that we want to tell you about. In fact, the brand that came in second was not as easily recognizable, yet. Manufacturers are held to stringent government safety standards which play an important role in keeping our children safe from harm. Parents also have a responsibility to read the instruction manual, check to see that all parts work as they should and to assemble the baby gear properly before use. In second place is a lesser known brand with a very unique, convertible quality that is exclusive to the manufacturer. 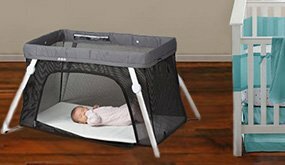 This item has only been around a short while but has quickly earned a solid number of 5 star reviews and high ratings as a safe and convenient travel crib and play yard. Best Play Yard for travel. In third place on our list of top-rated baby play yards is another budget friendly option from Graco. 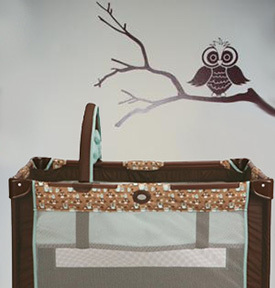 This, our third place pick, features an owl theme and gender neutral colors. 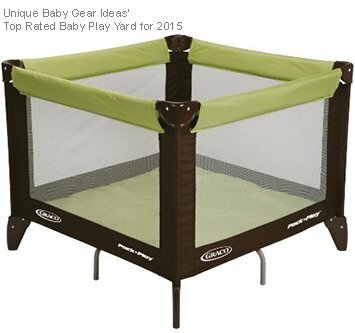 This playard, like the Fisher Price Rainforest Play Yard, is a favorite with those who prefer gear that complements the nursery's decor. Coming in 4th is the, (shocker, huh?) 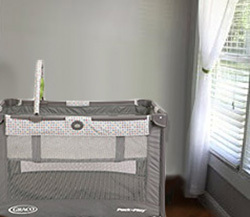 Graco Pasadena in Grey. It is very similar to the model that came in third and for some odd reason costs $1 less. Go here to see that there is very little difference between this TOP SELLER and some of the top rated models yet this one is for sale at nearly half the price. Please feel free to share your opinions and write your own reviews of playards that Unique Baby Gear Ideas recommends using the comments form provided for your convenience.